Deletions of the genes encoding the integrin αVβ8 (Itgav, Itgb8) have been shown to result in abnormal vascular development in the CNS, including prenatal and perinatal hemorrhage. Other work has indicated that a major function of this integrin in vivo is to promote TGFβ activation. In this paper, we show that Itgb8 mRNA is strongly expressed in murine Müller glia and retinal ganglion cells, but not astrocytes. We further show that Itgb8 deletion in the entire retina severely perturbs development of the murine retinal vasculature, elevating vascular branch point density and vascular coverage in the superficial vascular plexus, while severely impairing formation of the deep vascular plexus. The stability of the mutant vasculature is also impaired as assessed by the presence of hemorrhage and vascular basal lamina sleeves lacking endothelial cells. Specific deletion of Itgb8 in Müller glia and neurons, but not deletion in astrocytes, recapitulates the phenotype observed following Itgb8 in the entire retina. Consistent with αVβ8's role in TGFβ1 activation, we show that retinal deletion of Tgfb1 results in very similar retinal vascular abnormalities. The vascular deficits appear to reflect impaired TGFβ signaling in vascular endothelial cells because retinal deletion of Itgb8 reduces phospho-SMAD3 in endothelial cells and endothelial cell-specific deletion of the TGFβRII gene recapitulates the major deficits observed in the Itgb8 and TGFβ1 mutants. Of special interest, the retinal vascular phenotypes observed in each mutant are remarkably similar to those of others following inhibition of neuropilin-1, a receptor previously implicated in TGFβ activation and signaling. Vascular development within the brain and retina depends upon interactions of vascular cells with neighboring cells and extracellular matrix (ECM). These cells secrete growth factors, such as vascular endothelial growth factor (VEGF) and TGFβ, which are essential for vascular growth and stability. Integrins are cell-surface proteins implicated in numerous aspects of vascular development. Of particular interest are the αV-containing integrins, several of which promote activation of TGFβ (Glinka et al., 2011; Shi et al., 2011), which in turn regulates differentiation of endothelial cells and pericytes (Carmeliet and Jain, 2011). In the nervous and immune systems, the integrin αVβ8 is an important regulator of TGFβ (Yang et al., 2007; Mu et al., 2008; Aluwihare et al., 2009). Binding of αVβ8 to an RGD site in the latent complex of TGFβ results in release of the active protein (Mu et al., 2002; Cambier et al., 2005). In contrast to other integrins, αVβ8 is likely to be constitutively active (Helsten et al., 2008). Thus, regulation of αVβ8-dependent TGFβ activation likely depends on control of integrin expression levels as well as the presence other TGFβ latent complex-binding proteins, such as neuropilins, or proteases that cooperate with this integrin (Glinka et al., 2011; Shi et al., 2011). In the absence of αVβ8, vascular development in the brain is highly abnormal with elevated proliferation, impaired organization of endothelial cells and extensive hemorrhage, phenotypes mimicked by combined TGFβ1 and 3 mutation (McCarty et al., 2002; Zhu et al., 2002; Aluwihare et al., 2009). During brain vascular development, αVβ8 appears to be required on neuroepithelial cells, but not pericytes or endothelial cells (McCarty et al., 2005; Proctor et al., 2005). It is thought that neuroepithelial-derived αVβ8 activates ECM-sequestered TGFβ, which then has direct effects on surrounding vessels. Prior work showed that TGFβ signaling is required to maintain retinal vascular stability and retinal function in adult mice (Walshe et al., 2009), and TGFβ signaling has been implicated in several retinal diseases (Carmeliet and Jain, 2011). It is therefore important to understand how TGFβ signaling in the retina is regulated. In this paper, we characterize the role of αVβ8-TGFβ signaling in murine retinal vascular development. Our results show that deletion of the Itgb8 gene from retinal ganglia cells and Müller glia, but not astrocytes, results in highly abnormal vascular patterning and instability. An almost identical phenotype results from genetic removal of TGFβ1 from the retina. Our results show that deletion of Itgb8 results in decreased phosphorylation of SMAD3 in retinal vascular endothelial cells, and specific removal of the TGFβRII receptor from these cells recapitulates the major deficits observed in Itgb8 and Tgfb1 mutants. In addition, retinal deletion of Itgb8, Tgfb1, or Tgfbr2 also dramatically impairs formation of the retina's outer deep vascular plexus, as was previously seen following inhibition of neuropilin-1, a receptor previously implicated in TGFβ activation and signaling (Cao et al., 2010; Glinka et al., 2011). To generate heterozygous Itgb8icr mice, Itgb8+/− mice (Zhu et al., 2002) bred on a C57BL/6129S4 genetic background, were backcrossed for two generations with the ICR/CD-1 outbred strain. Itgb8icr+/− heterozygotes were then bred to generate mutant Itgb8icr−/− (β8icr−/−), mouse pups and Itgb8icr+/+ littermate controls, which were used for experiments. To specifically delete Itgb8 from retinal neuroepithelium including Müller glia, we used the nesCre mouse line (also known as NesCre8 (Petersen et al., 2002). Itgb8flox/flox females (Proctor et al., 2005) were crossed with Itgb8flox/+;NesCretg/+ males to obtain Itgb8flox/flox;NesCretg/+mutant pups (β8;nesCre) and Itgb8flox/+;NesCretg/+ littermate controls. To target retinal astrocytes for recombination, we used the mGFAP-Cre line 73.12 (Garcia et al., 2004). Tgfb1 heterozygotes (Tgfb1+/−) were bred on an NIH/Ola background, and then were intercrossed to generate mutant homozygous-null Tgfb1−/− mice. To conditionally delete Transforming Growth Factor β Receptor II (Tgfbr2) from retinal vascular endothelial cells, we crossed Tgfbr2flox/flox female mice (Levéen et al., 2002) with Platelet-Derived Growth Factor-B (Pdgfb)-inducible Cretg/+-iCreERTM2 mice (Claxton et al., 2008). Resultant Tgfbr2flox/+;Pdgfb-iCreERTM2 mice were crossed with Tgfbr2flox/flox mice to generate Tgfbr2flox/flox;Pdgfb-iCreERTM2 and Tgfbr2flox/flox;Pdgfb-iCreERTM2 pups for experiments. To evaluate for efficiency and specificity of Cre-mediated recombination we used Rosa26EYFP (Srinivas et al., 2001), or ROSA26tm14(CAG-tdTomato) (Ai14) (Madisen et al., 2010) reporter mice. Other than Itgb8icr and Tgfb1 mice, all mice were maintained on mixed genetic backgrounds. Mice were genotyped by PCR. Procedures were performed according to University of California, San Francisco Institutional Animal Care and Use Committee (UCSF IACUC)-approved guidelines. For EC-specific loss-of-function experiments, Tgfbr2flox/flox;Pdgfb-iCreERTM2 and Tgfbr2flox/+;Pdgfb-iCreERTM2 littermate controls were used. Tgfbr2 inactivation was induced by intragastric injection of 50 μl of tamoxifen solution (Sigma, T5648–1G, 1 mg/ml, generated by diluting a 10 mg/ml tamoxifen stock solution in 1:4 ethanol/corn oil with corn oil) once daily on postnatal day 1 (P1), P2, and P3 (for analysis at P6), or P5 and P6 (for analysis at P9). A hypodermic 27 G needle was used to administer tamoxifen solution. “TGFβRII;iΔEC” refers to Tgfbr2flox/flox;Pdgfb-iCreERTM2 mutants after administration of tamoxifen. Inducible genetic experiments were performed under UCSF IACUC-approved guidelines. Pups of the described crosses were killed and dissected at P6, P9, or P14 for investigation of retinal primary vascular plexus sprouting angiogenesis (P6) and deeper plexus vasculogenesis (P9, P14) (Pitulescu et al., 2010). For retina whole mounts, dissected eyes underwent weak fixation (for ease of hyaloid vasculature removal) in ∼2 ml of 4% paraformaldehyde (PFA) in PBS for 1 h on ice. Dissected retinas were further fixed at 4°C overnight in 4% PFA in PBS, and then stored at 4°C in PBS. Whole retinas were blocked in 5% BSA, 0.3% Triton X-100 in PBS (block buffer) overnight at 4°C before isolectin incubation and antibody administration. For isolectin labeling, retinas were transferred to Pblec buffer (PBS, pH 6.8, containing, in mm: 1 CaCl2, 1 MgCl2, 0.1 MnCl2, 1% Triton X-100) and then stained with isolectin B4 (IB4) overnight as previously described (Pitulescu et al., 2010). The following day, primary antibody labeling was performed in block buffer overnight at 4°C. After primary antibody incubation, retinas were labeled with SA-647 or SA-488 and fluorophore-conjugated secondary antibodies in block buffer for 2 h at room temperature. Stained whole retinas were flat-mounted with Prolong Gold (Invitrogen). For thin sectioning, whole eyes were fixed in 4% PFA overnight, then transferred to 30% sucrose in PBS overnight. Eyes were embedded in OCT then cryosectioned at 15 μm. Cryosections were permeabilized and blocked with 0.3% Triton X-100 and 3% BSA in PBS. Sections were incubated with primary antibodies overnight at 4°C, then with fluorophore-conjugated secondary antibodies (Invitrogen) and ToPro3 (Invitrogen) nuclear stain and then mounted with Prolong Gold (Invitrogen). Primary antibodies used were: monoclonal rat anti-CD31 clone MEC13.3 (BD PharMingen, 550274, 1:100), polyclonal rabbit anti-mouse Collagen IV (AbD Serotec, 2150-1470, 1:100), monoclonal mouse anti-α Smooth Muscle Actin Clone 1A4 (Sigma, A 2547, 1:100), monoclonal rat anti-mouse TER-119 Erythroid Antigen Antibody (R&D Systems, MAB1125, 1:100), polyclonal rabbit anti-phospho Histone H3 (Ser10) (Millipore, 06–570, 1:100), polyclonal rabbit anti-Glial Fibrillary Acidic Protein (Dako Cytomation, Z 0334, 1:100), monoclonal mouse anti-rat nestin clone rat-401 (4d4) (AbD Serotec, 21263, 1:100), polyclonal rabbit anti-glutamine synthetase (Thermo Scientific PA1-46165, 1:250), monoclonal mouse anti-Cellular Retinaldehyde-Binding Protein (Novus Biologicals, (B2) NB100-74392, 1:250), monoclonal rabbit anti-phospho-SMAD3 (Epitomics, 1:100) biotinylated GSL I-isolectin B4 (Vector Laboratories, B-1205, 1:25), mouse. Conjugated rabbit anti-GFP-Alexa Fluor 488 (1:100) was used to amplify endogenous eYFP signal from Rosa26 EYFP Cre reporter mice. Secondary antibodies used were: Alexa Fluor 488- or 647-conjugated goat anti-rat (Invitrogen, A21311 or A31852, 1:100), Alexa Fluor 555-conjugated goat anti-rabbit (Invitrogen, A31851, 1:100) and Alexa Fluor 488-, 555-, or 647-conjugated goat anti-mouse (Invitrogen, A21311 or A31851 or A31852, 1:100). Alexa Fluor 488- or 647-conjugated streptavidin (Invitrogen, S32354 or S32357, 1:100) was used to recognize Biotinylated GSL I-isolectin B4. In situ hybridization was performed on frozen sections as described previously (Wilkinson, 1999). The digoxigenin RNA labeling and detection kit from Roche Biochemicals was used to generate RNA probes using a 200 bp integrin β8 cDNA fragment from exon 4 as template. Tissue sections were hybridized overnight with digoxigenin-labeled RNA probes (0.4 mg/ml) at 60oC, washed in 2× SSC at 65oC, incubated with RNase (1 mg/ml in 2× SSC), washed in 0.2× SSC at 65°C, blocked in TBS with 10% sera, and incubated in alkaline phosphatase labeled anti-DIG antibody (Roche) (1:2000, 10% sera) overnight. Sections were incubated with NBT (nitroblue tetrazolium) and BCIP (5-bromo-4-chloro-3-indolyl-phosphate) (Roche) for the colorimetric detection of alkaline phosphatase activity. Staining was stopped after visual inspection. Sections were washed, fixed in 4% paraformaldehyde, and coverslipped. Confocal imaging was performed on a Zeiss LSM5 Pascal microscope. Absence of integrin αVβ8 perturbs development of the retinal vasculature. A–D, Flatmounts of P6 retinas from control, Itgb8 complete knock-out (β8icr−/−), nesCre-specific Itgb8 (β8;nesCre), and mGFAPCre-specific (β8;mGFAPCre) mutant retinas. A, Visualization of vasculature (collagen IV) and red blood cells (Ter119) reveals extensive hemorrhage in retinas of β8icr−/− mutants and substantial, but reduced hemorrhage in β8;nesCre mutants. β8;mGFAPCre retinas are comparatively normal. 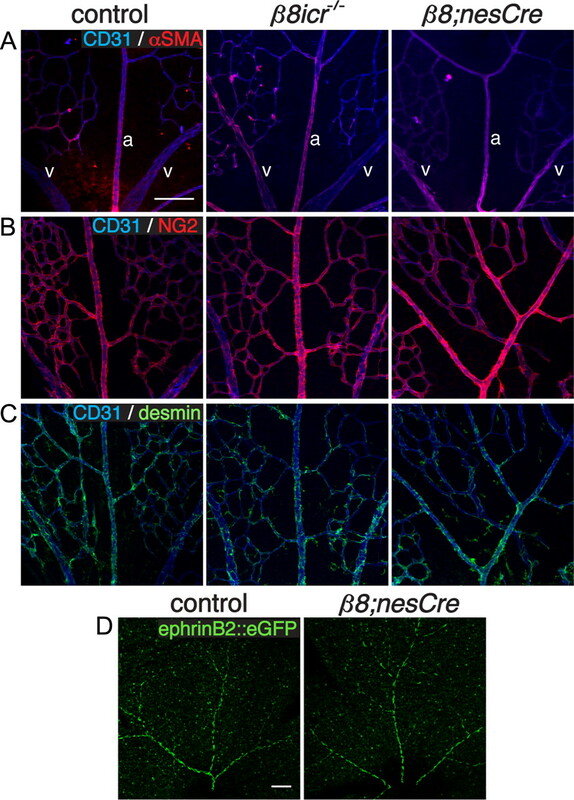 B, Higher-magnification images of vascular plexuses illustrate perturbed vascular branching and increased vascular density in β8icr−/− and β8;nesCre mutants compared with β8;mGFAPCre mutants and controls. C, Vascular endothelia (IB4) and collagen IV staining demonstrate elevated numbers of collagen IV sleeves lacking endothelia (arrows) in β8icr−/− and β8;nesCre mutants compared with β8;mGFAPCre mutants and controls. D, Images of angiogenic front in the control and three mutants reveals no overt differences in tip cell or filopodial morphology. E, Panels from P6 control, Itgb8 complete knock-out (β8icr−/−) and nesCre-specific Itgb8 (β8;nesCre) mutant retinas colabeled with anti-CD31 (endothelia) and anti-phospho-histone H3 (PH3, proliferating cells). Endothelial proliferation was not analyzed in β8;mGFAPCre mutants. F, Quantifications of vascular branch point density (number per 0.106 mm2 field), vessel coverage (percentage of area covered by CD31-expressing endothelial cells), empty collagen IV sleeves as illustrated in C (number per 0.0529 mm2 field), and endothelial cell proliferation (number of proliferating (PH3+), CD31+ endothelial cells per field as illustrated in E) demonstrate significant differences between control and β8icr−/− or β8;nesCre mutants, but no significant difference between control and β8;mGFAPCre mutants [ANOVA p-values < 0.0005; Tukey's subgroup analysis: *p < 0.05, **p < 0.005, ***p < 0.0005, NS = not significant. N = 16 (combined controls), N = 4 (β8icr−/−, β8;nesCre), N = 3 (β8;mGFAPCre)]. Error bars represent SEM. To examine the role of the Itgb8 gene in retinal vascular development, we first characterized the phenotype resulting from Itgb8 gene deletion throughout the animal, including all cells of the retina. For this, we used our original Itgb8 knock-out, outbred onto the ICR background (β8icr−/−) to permit survival into adulthood (Zhu et al., 2002; Lakhe-Reddy et al., 2006). Results, presented in Figure 1, show that complete Itgb8 deletion results in hemorrhage within the retina at P6 (Fig. 1A). Vascular organization in the superficial (primary) plexus at the level of the retinal ganglion cell layer is highly abnormal with excessive branching and increased vessel coverage of the retinal surface (Fig. 1B,F). The stability of the developing vasculature appears to be significantly reduced, as assessed by the presence of collagen IV segments lacking endothelial cells (Fig. 1C,F). Formation of the superficial vascular plexus appears to be transiently delayed in Itgb8 mutants (data not shown), but the densities and morphologies of vascular tip cells appear comparatively normal (Fig. 1D). Consistent with our prior observations within the CNS (Zhu et al., 2002), mutant retinal endothelial cells have an abnormally high rate of proliferation (Fig. 1E,F) and a very low level of apoptosis, not different from that in controls (data not shown). In addition, complete loss of Itgb8 resulted in no apparent alteration in pericyte coverage as assessed by colocalization of several pericyte-specific markers—α-smooth muscle actin (αSMA), NG2 and desmin (Fig. 2A–C). Normal expression of the arterial and arteriolar marker ephrinB2-eGFP in conditional Itgb8;nesCre mutants (see below) suggests that absence of this integrin does not prevent normal arterial-venous differentiation (Fig. 2D) (Wang et al., 1998; Adams and Klein, 2000). Thus, development of the superficial vascular plexus is not prevented by the absence of the integrin αVβ8, but the plexus appears unstable and exhibits other abnormalities that are likely to be the cause of hemorrhage. Normal mural cell coverage and arteriovenous differentiation in absence of integrin αVβ8 in P6 retinas. A, Panels illustrate colocalization of endothelial cells (CD31) and pericytes (α-smooth muscle actin, αSMA) in control, complete Itgb8 knock-out (β8icr−/−) and nesCre-specific Itgb8 (β8;nesCre) mutant retinas. In these images, two veins (v) are depicted on the left and right with an artery (a) present in the middle of each panel. B, Panels present sample images colabeled with CD31 (endothelial cells) and NG2 (pericytes) to visualize pericyte coverage in the control and mutants. C, Panels present representative images of retinas colabeled with CD31(endothelial cells) and desmin (pericytes). Note normal localization of the pericyte markers αSMA, NG2 and desmin in each mutant. D, Panels show representative images of arteries visualized with ephrinB2::eGFP that demonstrate normal arterial differentiation in control and representative β8;nesCre mutant. Scale bars, 100 μm. Following initial formation of a superficial vascular plexus at the level of the retinal ganglion cell layer, vessels sprout into the depth of the retina, growing along Müller glial cell processes, and establish two deep vascular plexuses (see diagrams, Fig. 3A,B). The outer deep vascular plexus first forms at the outer boundary of the inner nuclear layer by P9, followed by the inner deep vascular plexus which forms at the inner boundary of the inner nuclear layer by P14. When we compared development of the outer deep vascular plexus at P9 and P14 in control and Itgb8 mutant retinas, we observed that its formation is dramatically impaired in the mutant (Fig. 3A,B). Thus, integrin αVβ8 appears to be required for development of this plexus. In contrast, Itgb8 deletion does not prevent development of the inner deep vascular plexus. The vessels in the inner deep vascular plexus, however, are clearly abnormal, most obviously being thicker than in the control. Integrin αVβ8 is required for the development of the outer deep vascular plexus. A, B, Diagrams illustrate schematically the development of the deep retinal vascular plexus. By P9, vessels have sprouted from the superficial vascular plexus (SVP; green) and establish the outer deep vascular plexus (oDVP; red). Subsequently, the oDVP remodels, and the inner deep vascular pleuxus (iDVP) is established (B) by P14. Below diagrams: A, Flat-mounted retinas at P9 were stained for red blood cells (anti-Ter119) and vessels [anti-collagen IV (col IV), or anti-CD31]. Left panels demonstrate vascular instability and retinal hemorrhage in P9 β8icr−/− mutants. Middle and right panels are representative confocal optical slices taken from the superficial vascular plexus (SVP; green), and the outer deep vascular plexus (oDVP; red) within flat-mounted P9 retinas stained with the endothelial cell marker, anti-CD31. Middle panels are overlays of the SVP and DVP. Right panels in A are higher-magnification insets of outer DVP from boxed areas in middle panels. In contrast to control, β8icr−/− mutants do not establish a deep vascular plexus. B, Optical slices from flat mounted P14 retinas stained with IB4 illustrate perturbed remodeling of superficial vascular plexus (SVP; green), abnormally thickened vessels in the inner deep vascular plexus (iDVP; blue), and continued lack of an outer deep vascular plexus (oDVP; red) in β8icr−/− mutants compared with control. Scale bars, 100 μm. In prior work to identify the cells that must express integrin αVβ8 to prevent hemorrhage within the developing dorsal forebrain, we demonstrated through use of cell-specific Itgb8 knock-outs that expression of this integrin is required in the neuroepithelium and astroglia, but not within neurons or endothelial cells (Proctor et al., 2005). Analysis of cell-specific itgav knock-outs resulted in the same conclusion (McCarty et al., 2005). We therefore hypothesized that loss of Itgb8 expression from retinal glial populations (astrocytes and/or Müller glia) would also disrupt the developing retinal vasculature, similar to our observations in the complete Itgb8 knock-out. To explore this, we used two different cre transgenes: the nesCre transgene, which promotes Cre-mediated recombination in CNS neuroglial precursors starting at E8.5 (Petersen et al., 2002), and the mGFAP-driven Cre 73.12 transgene (Garcia et al., 2004), which efficiently recombines brain astrocytes. As shown in Figure 1A, nesCre-mediated deletion of Itgb8 virtually phenocopied mutants with complete loss of Itgb8 (β8icr−/−), displaying highly disorganized and unstable vasculature with excessive branch points, increased vessel coverage, increased empty collagen IV sleeves, and hemorrhage. Endothelial cells of the superficial vascular plexus had abnormally high levels of proliferation (Fig. 1E,F). Formation of the outer deep vascular plexus in β8nesCre (Itgb8;nesCre) mutants was severely disrupted (data not shown). As with β8icr mutants, conditional β8nesCre mutants had comparatively normal tip cells (Fig. 1D) as well as normal arteriovenous differentiation, and pericyte recruitment (Fig. 2). Surprisingly, when Itgb8 was deleted using the mGFAPCre transgene, the retinal vasculature appeared to be very similar to that in control retinas, with no hemorrhage or abnormalities in vessel coverage or branch point density (Fig. 1). While the data suggest that there may be an elevated number of empty collagen IV segments in this mutant, the difference was not statistically significant. To better understand the difference in phenotypes between β8nesCre and β8mGFAPCre mutants, we examined expression of itgb8 mRNA within the P6 retina by in situ analysis (Fig. 4A). For this purpose, we examined expression of Itgb8 exon 4, the exon flanked by loxP sites in the conditional itgb8 mutant (Proctor et al., 2005). In situ hybridization for Itgb8 mRNA demonstrates strong expression of Itgb8 in the inner nuclear layer, ganglion cell layer, and nerve fiber layer, consistent with expression in Müller glia cell bodies, descending processes, and endfeet, respectively, as well as retinal ganglion cells. Notably, expression of Itgb8 exon 4 is completely abolished by nesCre-mediated recombination, arguing that expression of αVβ8 is limited to cells—neurons or glia—targeted by nesCre. Itgb8 expression in Müller glia and retinal ganglion cells, but not retinal astrocytes. A, In situ hybridization for Itgb8 mRNA in P9 wild-type retina (top), and β8;nesCre mutant retinas (bottom). Itgb8-expressing Müller glia span the full thickness of the retina with heavy expression in the inner nuclear layer (INL), where Müller glia cell bodies reside, and in the nerve fiber layer (NFL) where Müller glial endfeet and astrocytes normally reside. There is staining for Itgb8 mRNA in the ganglion cell layer (GCL), indicating that retinal ganglion cells, in addition to Müller glia, express Itgb8. Note that all staining for Itgb8 mRNA is lost in the β8;nesCre mutant. The dark brown dots in the β8;nesCre mutant are red blood cells from retinal hemorrhage in this mutant. 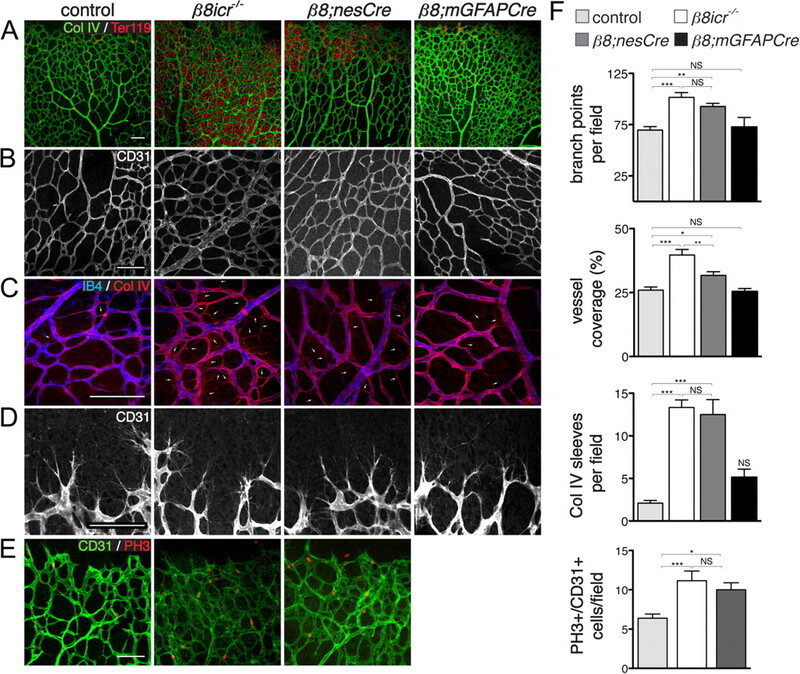 B–D, NesCre recombines Müller glia and retinal ganglion cells, but not retinal astrocytes, while mGFAPCre specifically recombines retinal astrocytes. B, Images depict nesCre-directed Rosa26RtdTomato;AI14 reporter expression (red), colabeled with Müller glia markers, nestin (green), Cellular retinaldehyde-binding protein (Cralp; green), and glutamine synthetase (GS; blue). NesCre directs recombination of Müller glia, retinal ganglion cells, and other neural cells of the retina. Arrowheads point to heavy expression of endogenous nestin on recombined Müller glia next to vessels penetrating into the deep retina. C, D, RosaR26-eYFP reporter expression (green) with endogenous nestin or GFAP (red), optical sections from flat mount retinas taken at the level of the NFL (C) or INL (D). C, Panels depict overlap of endogenous nestin with that of the nesCre-eYFP reporter. Arrowheads point to recombined Müller glial endfeet wrapping around blood vessels (unstained). Note absence of overlap of endogenous GFAP present in retinal astrocytes with the eYFP reporter. Arrow points to an exemplary astrocyte cell body labeled by GFAP, but lacking eYFP recombination marker. Note that because nesCre promotes recombination in progenitors of many retinal cells in addition to Müller Glia, there is extensive expression of the eYFP reporter in cells that do not express nestin. Right panels depict overlap of endogenous GFAP (red) with mGFAPCre (mGfap-Cre73.12)-mediated recombination as visualized using the RosaR26-eYFP reporter (green). Arrow points to an astrocyte cell body labeled by GFAP with strong overlapping eYFP recombination marker. D, Fibers of Müller glia extend into the deeper retina and are recombined by nesCre, whereas there are no GFAP-staining astrocyte fibers in this layer, and no recombination from the mGFAPcre transgene in this layer. Scale bars, 50 μm. To further examine the cellular specificity of the nesCre and mGFAPCre lines, we used two different reporters—Rosa26;tdTomato;Ai14 (Madisen et al., 2010) and R26R-EYFP (Srinivas et al., 2001). 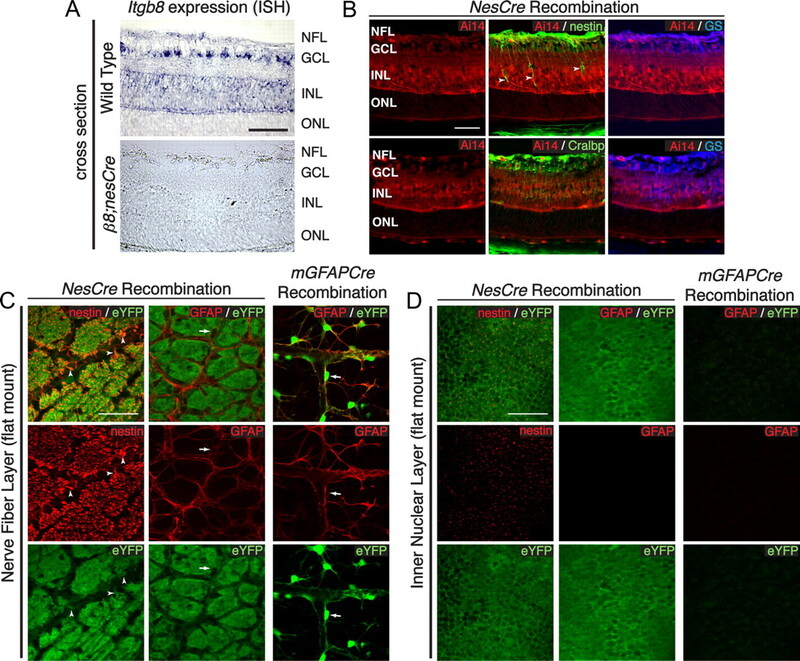 Results using each reporter, presented in Figure 4, B and C, show that nesCre mediates recombination in a large majority of neural and glial cells within the retina, including but not restricted to nestin-, glutamine synthetase-, and CRALBP-expressing Müller Glia (Close et al., 2005). Interestingly, data using the EYFP reporter show that nesCre does not promote detectable recombination in GFAP-expressing retinal astrocytes (Fig. 4C), even though these cells migrate into the eye from the optic nerve (Watanabe and Raff, 1988). In contrast, our data show that the mGFAP-driven Cre 73.12 transgene promotes efficient recombination in GFAP-expressing astrocytes, but not within nestin-expressing Müller glia (Fig. 3C,D). Together with the in situ data that indicated that nesCre-mediated recombination virtually eliminated itgb8 expression within the retina (Fig. 4A), the results argue that retinal astrocytes do not play a significant role in αVβ8-mediated vascular development. The complete loss of itgb8 mRNA expression observed following nesCre-mediated recombination indicates that GFAP-expressing astrocytes do not express significant levels of αVβ8. Together with prior observations within the CNS that excluded a neuronal role in αVβ8-mediated signaling (Proctor et al., 2005), our results suggest that αVβ8 expression on Müller glia is required for formation of a normal and stable vascular plexus and to prevent hemorrhage. As summarized in the introduction, there is compelling evidence that a major role of integrin αVβ8 in vivo is to facilitate release of active TGFβ from large and small latent TGFβ-containing inactive complexes (Mu et al., 2002; Aluwihare et al., 2009). To obtain direct evidence that the presence of integrin αVβ8 promotes TGFβ signaling within the developing retina, we quantified phospho-SMAD3 levels in vessel-associated nuclei in control and Itgb8 mutant retinas. Results (Fig. 5A,B) show that elevated numbers of endothelial cells, identified through colabeling with the endothelial cell marker CD31, are present in the mutant retina. This is consistent with data above demonstrating elevated endothelial cell proliferation in the Itgb8 mutant. When phospho-SMAD3 levels within each endothelial cell nucleus were quantified, however, significantly less phospho-SMAD3 was observed in each of the mutant nuclei (Fig. 5A,B). On balance, these observations indicate that absence of the integrin αVβ8 results in reduced TGFβ signaling within endothelial cells. Phospho-SMAD3 signaling is reduced, in endothelial cells of integrin β8 mutants. A, Top, Representative thin sections from P9 retinas illustrating phospho-SMAD3 (pSMAD3, red) colocalization with endothelial cell-specific-CD31 (green) in control and itgb8 complete knock-out retinas. Bottom are rainbow spectrum intensity maps of phospho-SMAD3 staining delimited by CD31 staining from boxed regions in panels above (red, most intense staining; blue, least intense staining). Whereas most endothelial cells in the superficial and deep vascular plexuses of control mice are strongly positive (arrows) and few weakly positive (arrowheads) for pSMAD3 staining, relatively few endothelial cells are strongly positive and most are weakly positive for pSMAD3 in mutants. Note the thickened superficial vascular plexus (SVP) and lack of a deep vascular plexus (DVP) in the mutant versus control sections. B, Quantification of vascular nuclei per 100 μm length of the vasculature documents a significant increase in the density of vasculature-associated endothelial cells in the mutant. The intensity of phospho-SMAD3 labeling of each endothelial nucleus was quantified in B in arbitrary units. The intensity of labeling in individual nuclei as well as the mean leveling densities presented in this graph documents a significant reduction in endothelial cell-specific phospho-SMAD3 levels in mutants compared with controls. p-values from Student's t test: *p = 0.019, ***p < 0.0001; N = 3 (controls), N = 3 (β8icr−/− mutants). Error bars in all graphs represent SEM. Scale bars: (A), 100 μm; (C), 50 μm. To strengthen this conclusion, we examined the phenotypes with in the retina of mice lacking TGFβ1 ligand (Tgfb1−/− mutant). In results presented in Figure 6, we observed the presence of hemorrhage and a highly abnormal vasculature in this mutant. The superficial vascular plexus in this mutant exhibited an elevated density of branch points, elevated coverage of the retinal surface and increased proliferation of the endothelial cells. The vasculature also appeared to be unstable as documented by increased numbers of collagen IV sleeves lacking endothelial cells. These observations indicate that mice lacking TGFβ1 ligand exhibit retinal vascular phenotypes very similar to those observed in the β8icr−/− and β8nesCre conditional mutants (Fig. 1). Absence of Tgfb1, and inhibition of TGFβ signaling in retinal endothelial cells recapitulate the vascular abnormalities observed in the Itgb8 mutants. A, Representative images of retina flat-mounts of control, Tgfb1−/− and endothelial-specific Tgfbr2 mutant (TGFβRII;iΔEC) P6 retinas. TGFβRII;iΔEC mutant retinas were generated using animals homozygous for the Tgfbr2-flox allele bearing also a Pdgfb promoter-regulated Cre-ER-T2 transgene. Cre recombination was induced by intragastric tamoxifen injections (50 μg) at P1, P2, and P3. Loss of TGFβ1 or TGFβRII results in hemorrhage at P6 as illustrated by extravascular red blood cells (Ter119) in the mutant retinas (left panels). Endothelial cells, visualized by endothelial cell-specific expression of tdTomato (Pdgfb-CreERTM2-mediated expression of recombination marker tdTomato from Rosa26RtdTomato;AI14 allele) and/or CD31 labeling illustrate enhanced vascular branching density in P6 Tgfb1−/− and TGFβRII;iΔEC mutant retinas. Localization of vascular endothelia (IB4) and collagen IV illustrate increased presence of collagen IV sleeve segments lacking endothelial cells (IB4-negative; arrows) in Tgfb1−/− and TGFβRII;iΔEC mutants. The relative distribution of α-smooth muscle actin (SMA) and NG2-expressing pericytes compared with CD31-expressing endothelial cells in control compared with mutants suggests that pericyte coverage is normal in the mutants. The same panels document reasonably normal arterial (a) and venous (v) differentiation in mutants. Colabeling with anti-CD31 and the tdTomato recombination reporter (to colabel endothelial cells) and phosphohistone3 (PH3) illustrate an increased density of proliferating endothelial cells in P6 Tgfb1−/− and TGFβRII;iΔEC mutant retinas. 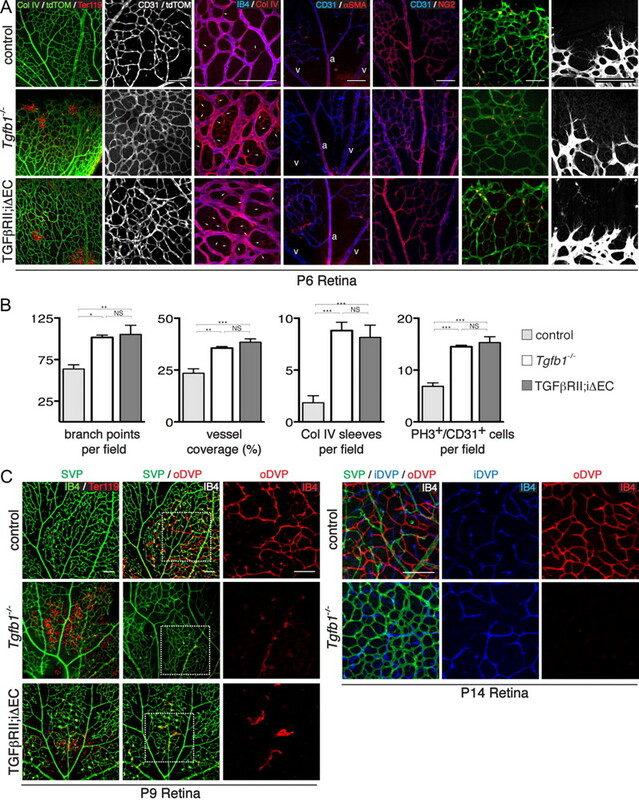 Images of the angiogenic front in control and mutant P6 retinas indicate that the morphologies and numbers of endothelial tip cells and their filopodia are not obviously perturbed in the Tgfb1−/− or endothelial-specific Tgfbr2 (TGFβRII;iΔEC) mutants. B, Panels present quantification of changes in retinal vascular development at P6 as a result of Tgfb1−/− deletion or endothelial cell-specific deletion of Tgfbr2. Results demonstrate that as a result of loss of TGFβ1 or impaired TGFβRII function, there are increases in vascular branch point density, the area of retina covered by vascular endothelial cells, the number of collagen IV sleeve segments lacking endothelial cell coverage, and the number of proliferating endothelial cells. ANOVA p-values: branch points per field, p < 0.0056; vessel coverage (%), Col IV sleeves per field, and PH3+/CD31+ cells per field, p < 0.0001. Tukey's subgroup analysis: *p < 0.05, **p < 0.005, ***p < 0.0005, NS = not significant; N = 9 (combined controls), N = 3 (Tgfb1−/−, TGFβRII;iΔEC). Error bars represent SEM. C, Representative images of flat-mounts of control, Tgfb1−/− and endothelial-specific Tgfbr2 (TGFβRII;iΔEC) mutant P9 and P14 retinas. Endothelial-specific Tgfbr2 mutant retinas were analyzed following tamoxifen administration (50 μg) on P5 and P6, retinal vascular phenotypes were analyzed on P9 by immunostaining vessels (IB4; green) and red blood cells (Ter119). Confocal optical slices were taken from the superficial vascular plexus (SVP, green), the inner deep vascular plexus (iDVP; blue), and the outer deep vascular plexus (oDVP, red) as illustrated in diagram in Figure 1. At P9, absence of TGFβ1 or acute loss of TGFβRII from endothelial cells leads to disruption of the SVP with corresponding leakage of red blood cells. At P9 formation of the outer DVP is dramatically inhibited in the absence of TGFβ1 or TGFβ receptor 2 in retinal endothelial cells. Right panels in P9 retina image sets are higher-magnification insets of outer DVP from boxed areas in middle panels. At P14 absence of TGFβ results in continued failure of formation of the outer deep vascular plexus. The inner deep vascular plexus does form in the mutant with abnormally thickened vessels, similar to the phenotypes in the Itgb8 mutant. At P14, TGFβRII;iΔEC mutants were sickly and obviously smaller than littermate controls, and so were not analyzed. Scale bars, 100 μm. To provide direct evidence that TGFβ signaling within endothelial cells is required for normal vascular development within the retina, we examined retinas in mice with conditional deletion from endothelial cells of the gene encoding the essential TGFβ receptor, TGFβRII. This receptor subunit is required for both Alk1 and Alk5 (type I TGFβ receptors)-mediated TGFβ signal transduction (Schmierer and Hill, 2007). To examine the likely involvement of endothelial cells, we deleted Tgfbr2 by crossing Tgfbr2flox mice with inducible platelet-derived growth factorB-Cre-ERTM2 mice (Levéen et al., 2002; Claxton et al., 2008). A tamoxifen-dependent Cre was used for these experiments because the constitutive absence of TGFβRII in endothelial cells results in early embryonic lethality due to cardiovascular deficits(Jiao et al., 2006; Carvalho et al., 2007; Robson et al., 2010). To promote postnatal Tgfbr2 deletion, newborn pups were injected with tamoxifen at P1, P2, and P3. Conditional recombination was followed in mutant and control animals with the Rosa26;tdTomato;Ai14 Cre reporter (Madisen et al., 2010). When the superficial vascular plexus was examined at P6, the mutant showed a very similar phenotype to that observed in the complete absence of retinal αVβ8 or TGFβ1 including prominent retinal hemorrhage (Fig. 6A). In addition, the mutant retinas formed vascular plexuses with an abnormally high density of branches and elevated coverage of the retinal surface by the vasculature (Fig. 6A,B). Proliferation of endothelial cells was abnormally high in the mutant (Fig. 6B). The increased density of collagen IV sleeves lacking endothelial cells indicated that vascular stability was reduced (Fig. 6A,B). As in the Itgb8 and Tgfb1 mutants, the apparently normal association of α-smooth muscle actin and NG2-expressing cells suggests that pericyte coverage of the vasculature was comparatively normal (Fig. 6A) and the density and morphology of endothelial tip cells at the angiogenic front appeared similar in both the control and mutant retinas (Fig. 6A). Thus, endothelial cells appear to be an essential target for integrin αVβ8-dependent TGFβ signaling that facilitates formation of a normal superficial vascular plexus. To examine the potential role of endothelial cell TGFβ signaling in promoting vessel stability after formation, and in the formation of the deep vascular plexus, we examined Tgfb1 and conditional endothelial cell-specific Tgfrb2flox mutants, the latter initiated by tamoxifen injections into pups at P5 and P6. When the retinas were examined at P9, the preestablished superficial vascular plexus appeared to be disrupted with tortuous vessel segments and associated hemorrhage (Fig. 6C,D). In addition, the outer deep vascular plexus in the outer portion of the inner nuclear layer was virtually absent (Fig. 6C,D) in both mutants. As with the β8icr−/− and β8nesCre mutants, the inner deep vascular plexus of Tgfb1 mutants developed by P14, but the outer deep plexus did not form. Even though the inner deep vascular plexus does form, it was clearly abnormal with vessels much thicker than those present in the control. (Endothelial cell-specific Tgfbr2 mutants were significantly smaller than controls at P14, and were therefore not studied at this time point.) Thus, these results, together with the requirement for integrin αVβ8, indicate that integrin αVβ8 promotes release of active TGFβ1, which then signals through endothelial cells to promote primary angiogenesis and vascular stabilization in the retina. Results presented in this paper show that absence in the developing retina of integrin αVβ8 as a result of Itgb8 gene deletion results in major abnormalities in retinal vessel formation, including increased endothelial proliferation, elevated vascular branching, reduced vasculature segment stability and hemorrhage. In addition, absence of this integrin severely compromised formation of the deep vascular plexus. In contrast, endothelial tip cells in the primary plexus and pericyte coverage of the nascent vessels in this plexus appeared comparatively normal. Thus, absence of αVβ8 appears to affect primarily reorganization and maturation of endothelial cells within the primary plexus, although it clearly has a more dramatic effect on the formation of the outer deep vascular plexus. The phenotype of the Itgb8 mutant is mimicked by neuroepithelial-specific deletion of Itgb8 using the nesCre transgene, indicating that TGFβ is mostly likely activated by αVβ8 on surfaces of neuroepithelial cells and Müller glia. Indeed, we see intense staining for Itgb8 mRNA in a distribution similar to that of Müller glial cell bodies and processes, which is entirely lost in the conditional β8nesCre mutants. Interestingly, retinal astrocytes do not appear to have an essential role in controlling TGFβ signaling because hemorrhage and vascular abnormalities are not observed following specific deletion of Itgb8 gene deletion within these cells, using mGFAPCre. These cells seem unlikely to express significant levels of αVβ8 because expression of Itgb8 mRNA appears to be almost absent from the retina in the conditional β8nesCre mutant, despite the presence of a normal Itgb8 gene within GFAP-expressing astrocytes,. Thus, it is not surprising that the presence of a normal Itgb8 gene within retinal astrocytes does not prevent the vascular abnormalities observed in the β8;nesCre mutant. Our observations are consistent with the observed colocalization of integrin β8 with markers of radial glia in a perivascular distribution in the developing CNS (Cambier et al., 2005). With their close apposition to developing blood vessels of both the superficial vascular plexus and the penetrating vessels which form the deep vascular plexus, retinal Müller glia are well positioned to provide important paracrine signaling effectors such as VEGF or TGFβ. Indeed, Müller glia are known to secrete various growth factors involved in both physiologic and pathologic retinal angiogenesis (Harada et al., 2005, 2011; Ye et al., 2009, 2011). Our observations on the apparently minor importance of astrocyte αVβ8 are similar to those indicating that retinal astrocyte-derived VEGF is also relatively dispensable during development (Scott et al., 2010). Another major finding of the present study is that levels of phospho-SMAD3 within endothelial cell nuclei are reduced significantly in the Itgb8 mutant compared with control endothelial cells, providing direct evidence that absence of this integrin impairs TGFβ signaling within the developing vasculature. This result is entirely consistent with recent evidence showing that in cell culture, astroglial-derived αVβ8 binds to and activates latent TGFβ1 and 3, which then transactivates brain endothelial cells (Mu et al., 2002; Cambier et al., 2005); with the immunohistochemical localization of TGFβ1 and 3 in perivascular basement membranes of the retina (Lutty et al., 1993); and with work that demonstrates an essential role for TGFβ signaling in maintaining developmental and adult retinal microvascular homeostasis and barrier function (Walshe et al., 2009; Mahmoud et al., 2010). Moreover, we show that the vascular phenotypes found in Itgb8 mutants are also observed following abolition of TGFβ signaling in retinal endothelial cells through tamoxifen-induced, Cre-mediated deletion of the essential TGFβ receptor subunit, TGFβRII. These previous studies, and this current work therefore establish that αVβ8-mediated activation of TGFβ signaling in endothelial cells in vivo has an essential role in enhancing vascular maturation and stability within the developing retina. This work also suggests that αVβ8-TGFβ signaling could play an important role in vascular patterning and barrier formation in various developmental and pathological contexts outside of the retina. Overall these results are consistent with, but extend our prior studies on the role of this integrin in CNS vascular development. In prior work, we showed that loss of Itgb8 leads to vascular dysplasia and hemorrhage in the brain (Zhu et al., 2002). These effects were specific to integrin αVβ8 expressed in neuroepithelial cells and radial glia, as neuroepithelial deletion of integrin αVβ8 completely recapitulates the Itgb8 KO brain phenotype. In contrast, Itgb8 deletion from brain astrocytes, microglia, pericytes, postmitotic neurons, or endothelial cells, did not result in an obvious vascular deficit (Proctor et al., 2005; our unpublished observations). Our present studies extend this work by providing a direct demonstration that canonical TGFβ signaling is reduced in the mutant vasculature as well as showing the importance of this integrin within the developing retina. The retinal vascular phenotypes resulting from loss of αVβ8-TGFβ1 signaling, and in particular the loss of outer deep vascular plexus formation, are similar to those seen in several other mouse mutants. Of note, Ang2-defient mice (Hackett et al., 2000, 2002); mice with defective Norrin/Frizzled-4/Lrp5 signaling (Ye et al., 2009); mice with defective Jagged1/Dll4/Notch signaling (Benedito et al., 2009); and mice with defective neuropilin-1 signaling (Pan et al., 2007) all lack formation of the outer deep vascular plexus. Neuropilin-1 is of particularly relevance to this study because its ligands include active and latent TGFβ (Pan et al., 2007; Glinka and Prud'homme, 2008; Cao et al., 2010; Glinka et al., 2011). Neuropilin-1 inhibition has been shown to increase vascular density within the primary vascular plexus and to severely impair formation of the deep vascular plexus with little effect on VEGFRII signaling (Pan et al., 2007). Within the CNS, the abnormal endothelial proliferation and organization seen in the neuropilin-1 mutant is strikingly similar to that observed in the Itgb8 mutant (Zhu et al., 2002; Gerhardt et al., 2004). As recent data indicate that the neuropilins bind both latent and active TGFβ, facilitate TGFβ activation, and control the balance of phosphorylation of different SMAD effectors of TGFβ signaling (Glinka and Prud'homme, 2008; Cao et al., 2010; Glinka et al., 2011), it is not clear precisely how αVβ8 and neuropilin signaling intersect in the retina. As αVβ8 binding alone does not appear sufficient to activate latent TGFβ complexes (Mu et al., 2002), it is possible that neuropilin is required for latent complex activation, perhaps through generation of tension (Shi et al., 2011). Together, our findings suggest a novel paradigm for coupling neuroglia cells to blood vessels during development through αVβ8-TGFβ signaling. Considering the already well characterized role for TGFβ in angiogenic pathologies, it is tempting to speculate that αVβ8 may play parallel roles in human gliovascular diseases. Angiogenesis and associated vessel instability are hallmark features of retinopathy of prematurity and proliferative diabetic retinopathy. Intriguingly, TGFβ is dysregulated in both human and experimental retinopathy of prematurity (Shih et al., 2003; Drenser, 2009). Similarly, genetic polymorphisms in TGFβ1 are associated with increased risk for proliferative diabetic retinopathy (Beránek et al., 2002). TGFβ levels are altered in both human and experimental proliferative diabetic retinopathy (Pfeiffer et al., 1997; Gerhardinger et al., 2009), and systemic TGFβ blockade in adult mice disrupts retinal vessel architecture and barrier function, reminiscent of pathological changes associated with proliferative diabetic retinopathy (Walshe et al., 2009). Finally, some studies show that selective inhibition of integrin αV, β8's only known dimerization partner, significantly attenuates neo-angiogenesis in experimental proliferative retinopathies (Chavakis et al., 2002). Selective inhibition of integrin β8 in these settings might similarly affect pathological retinal angiogenesis. A related paper was published recently after the submission of our revised manuscript (Hirota et al., 2011). Both papers used nestin-driven Cre expression to delete Itgb8 within the retinal precursor cells and observed similar retinal hemorrhagic phenotypes. Harada et al. (2011) report a deficit in tip cell filopodia density not observed in our study. The authors did not include a description of the abnormalities in vascular branch point density, coverage, or stability that were observed in our study. Both papers provide data that strongly supports a role of this integrin in development of the secondary (deep) vascular plexus. Hirota et al. (2011) did not examine the role in the outer versus inner deep vascular plexus. Retinal anti-TGF injection by Hirota et al. (2011) provided data complementary to ours on the role of TGF as a downstream effector of this integrin. The most important disagreement between our papers concerns the role of V8 in retinal astrocytes versus Müller glia. Hirota et al. (2011) concluded that retinal astrocyte-expressed V8 is required for normal retinal angiogenesis because they observed expression of this integrin in cultured retinal astrocytes. Our data indicates that nestin-Cre promotes efficient gene deletion in Müller glia, but not retinal astrocytes in vivo. We also observed expression of the 8 subunit in Müller glia, but not retinal astrocytes in vivo. Following astrocyte-specific, GFAP-Cre-mediated Itgb8 deletion in vivo, we did not detect retinal hemorrhage or significant abnormalities in vascular branching, coverage, or stability. It seems likely that the cultures examined by Hirota et al. (2011) contained Müller glia that mediated TGF activation. This work has been supported by a Leducq Foundation Transatlantic Network of Excellence, NIH Grant NS19090, and the Pediatric Scientist Development Program (NICHD). (2000) Eph receptors and ephrin ligands. essential mediators of vascular development. Trends Cardiovasc Med 10:183–188. (2009) Mice that lack activity of alphavbeta6- and alphavbeta8-integrins reproduce the abnormalities of Tgfb1- and Tgfb3-null mice. J Cell Sci 122:227–232. (2009) The notch ligands Dll4 and Jagged1 have opposing effects on angiogenesis. Cell 137:1124–1135. (2002) Polymorphism R25P in the gene encoding transforming growth factor-beta (TGF-beta1) is a newly identified risk factor for proliferative diabetic retinopathy. Am J Med Genet 109:278–283. (2005) Integrin alpha(v)beta8-mediated activation of transforming growth factor-beta by perivascular astrocytes: an angiogenic control switch. Am J Pathol 166:1883–1894. (2010) Neuropilin-1 mediates divergent R-Smad signaling and the myofibroblast phenotype. J Biol Chem 285:31840–31848. (2011) Molecular mechanisms and clinical applications of angiogenesis. Nature 473:298–307. (2007) Compensatory signalling induced in the yolk sac vasculature by deletion of TGFbeta receptors in mice. J Cell Sci 120:4269–4277. (2002) Kinetics of integrin expression in the mouse model of proliferative retinopathy and success of secondary intervention with cyclic RGD peptides. Diabetologia 45:262–267. (2008) Efficient, inducible Cre-recombinase activation in vascular endothelium. Genesis 46:74–80. (2005) Retinal neurons regulate proliferation of postnatal progenitors and Muller glia in the rat retina via TGF beta signaling. Development 132:3015–3026. (2009) Anti-angiogenic therapy in the management of retinopathy of prematurity. Dev Ophthalmol 44:89–97. (2004) GFAP-expressing progenitors are the principal source of constitutive neurogenesis in adult mouse forebrain. Nat Neurosci 7:1233–1241. (2009) The transforming growth factor-beta pathway is a common target of drugs that prevent experimental diabetic retinopathy. Diabetes 58:1659–1667. (2004) Neuropilin-1 is required for endothelial tip cell guidance in the developing central nervous system. Dev Dyn 231:503–509. (2008) Neuropilin-1 is a receptor for transforming growth factor beta-1, activates its latent form, and promotes regulatory T cell activity. J Leukoc Biol 84:302–310. (2011) Neuropilin-1 exerts co-receptor function for TGF-beta-1 on the membrane of cancer cells and enhances responses to both latent and active TGF-beta. Carcinogenesis 32:613–621. (2000) Angiopoietin 2 expression in the retina: upregulation during physiologic and pathologic neovascularization. J Cell Physiol 184:275–284. (2002) Angiopoietin-2 plays an important role in retinal angiogenesis. J Cell Physiol 192:182–187. (1996) Subcutaneous injection of a cyclic peptide antagonist of vitronectin receptor-type integrins inhibits retinal neovascularization. Nat Med 2:529–533. (2005) Role of neurotrophin-4/5 in neural cell death during retinal development and ischemic retinal injury in vivo. Invest Ophthalmol Vis Sci 46:669–673. (2011) Glia- and neuron-specific functions of TrkB signalling during retinal degeneration and regeneration. Nat Commun 2:189. (2008) Differences in regulation of Drosophila and vertebrate integrin affinity by talin. Mol Biol Cell 19:3589–3598. (2011) The astrocyte-expressed integrin V8 governs blood vessel sprouting in the developing retina. Development 138:5157–66. (2006) Tgfbeta signaling is required for atrioventricular cushion mesenchyme remodeling during in vivo cardiac development. Development 133:4585–4593. (2006) Beta8 integrin binds Rho GDP dissociation inhibitor-1 and activates Rac1 to inhibit mesangial cell myofibroblast differentiation. J Biol Chem 281:19688–19699. (2002) Induced disruption of the transforming growth factor beta type II receptor gene in mice causes a lethal inflammatory disorder that is transplantable. Blood 100:560–568. (1993) Heterogeneity in localization of isoforms of TGF-beta in human retina, vitreous, and choroid. Invest Ophthalmol Vis Sci 34:477–487. (2010) A robust and high-throughput Cre reporting and characterization system for the whole mouse brain. Nat Neurosci 13:133–140. (2010) Pathogenesis of arteriovenous malformations in the absence of endoglin. Circ Res 106:1425–1433. (2002) Defective associations between blood vessels and brain parenchyma lead to cerebral hemorrhage in mice lacking alphav integrins. Mol Cell Biol 22:7667–7677. (2005) Selective ablation of alphav integrins in the central nervous system leads to cerebral hemorrhage, seizures, axonal degeneration and premature death. Development 132:165–176. (2002) The integrin alpha(v)beta8 mediates epithelial homeostasis through MT1-MMP-dependent activation of TGF-beta1. J Cell Biol 157:493–507. (2008) TGFbeta1 and TGFbeta3 are partially redundant effectors in brain vascular morphogenesis. Mech Dev 125:508–516. (2007) Blocking neuropilin-1 function has an additive effect with anti-VEGF to inhibit tumor growth. Cancer Cell 11:53–67. (2002) Progenitor cell maintenance requires numb and numblike during mouse neurogenesis. Nature 419:929–934. (1997) Growth factor alterations in advanced diabetic retinopathy: a possible role of blood retina barrier breakdown. Diabetes 46(Suppl 2):S26–S30. (2010) Inducible gene targeting in the neonatal vasculature and analysis of retinal angiogenesis in mice. Nat Protoc 5:1518–1534. (2005) Vascular development of the brain requires beta8 integrin expression in the neuroepithelium. J Neurosci 25:9940–9948. (2010) The TGFbeta type II receptor plays a critical role in the endothelial cells during cardiac development. Dev Dyn 239:2435–2442. (2007) TGFbeta-SMAD signal transduction: molecular specificity and functional flexibility. Nat Rev Mol Cell Biol 8:970–982. (2010) Astrocyte-derived vascular endothelial growth factor stabilizes vessels in the developing retinal vasculature. PLoS One 5:e11863. (2003) Transforming growth factor beta1 induction of vascular endothelial growth factor receptor 1: mechanism of pericyte-induced vascular survival in vivo. Proc Natl Acad Sci U S A 100:15859–15864. (2011) Latent TGF-beta structure and activation. Nature 474:343–349. (2001) Cre reporter strains produced by targeted insertion of EYFP and ECFP into the ROSA26 locus. BMC Dev Biol 1:4. (2009) TGF-beta is required for vascular barrier function, endothelial survival and homeostasis of the adult microvasculature. PLoS One 4:e5149. (1998) Molecular distinction and angiogenic interaction between embryonic arteries and veins revealed by ephrin-B2 and its receptor Eph-B4. Cell 93:741–753. (1988) Retinal astrocytes are immigrants from the optic nerve. Nature 332:834–837. (1999) In situ hybridization: a practical approach (Oxford UP, New York). (2007) Absence of integrin-mediated TGFbeta1 activation in vivo recapitulates the phenotype of TGFbeta1-null mice. J Cell Biol 176:787–793. (2009) Norrin, frizzled-4, and Lrp5 signaling in endothelial cells controls a genetic program for retinal vascularization. Cell 139:285–298. (2011) Expression of the Norrie disease gene (Ndp) in developing and adult mouse eye, ear, and brain. Gene Expr Patterns 11:151–155. (2002) beta8 integrins are required for vascular morphogenesis in mouse embryos. Development 129:2891–2903.